Our Fastrack student faces a week of one-day, shore-based courses at Sally Water Training in East Cowes. This week we are spending at Sally Water Training in East Cowes to do a week of ‘tickets’ starting with powerboating. As tough as it initially felt studying on a Saturday, a day of bombing around the Solent was not a bad compromise. Conditions were quite choppy, with a force six whipping up four to six foot waves, and our instructors Andrew and Graham were well aware of what lay ahead. ‘You WILL get wet’ said Andrew as we jumped aboard the 19 foot RIBs. He wasn’t wrong! It was like standing under a power shower with a severe gale blowing in your face. I challenge any waterproofs to keep out the water our RIB took in 15 minutes at full throttle. But drenched or not, we went through the exercises of performing 360 degree turns, retrieving ‘Kenny’, our man over board, and putting the RIB to the test on a makeshift slalom course. The boys were certainly in their element and wasted no time in finding out exactly how fast the 50hp Yamaha 4 stroke could go, six foot waves and screaming fellow students be damned! I tried to stay focussed on the scenery flashing past, including the enormous USS Enterprise aircraft carrier at anchor off Portsmouth. All this before lunch – thank goodness! The afternoon session was a little less hairy and was carried out in the calm waters of the Medina River. ‘Pontoon bashing’ as Andy and Graham called it, otherwise known as coming alongside, was practised until perfect, as was mooring up to buoys, turning in a confined space and figures of eight astern. Cold, wet yet buzzing we returned to the classroom to drink cups of tea and go over the day’s exercises. A short test to ensure that amongst all the fun and adrenalin rushing we had actually learnt something ended the day. Back in the classroom and straight into the VHF radio one-day course. 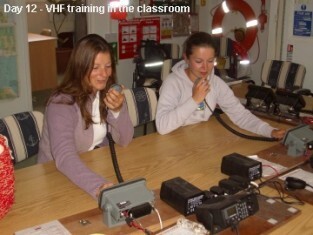 Sally Water Training has a fantastic working classroom with an array of VHF radios fixed at the desks, allowing students to simulate radio conversations and explore the sets. Each set can receive ‘live’ radio broadcasts but are designed to block transmissions leaving the classroom. Or so we all thought? After Baris relayed his practice Mayday message about pirates boarding his yacht off Penzance, we heard a response on channel 16 from a concerned yachtsman who had heard received the message. He relayed the distress call to the Solent Coastguard who called up the fictitious ‘September Nights’ for confirmation. We were all dumbfounded! Andrew appeased the situation with a brisk mobile phone call to the coastguard and subsequent scenarios were prefixed with ‘This is an exercise!’, loud and clear to avoid any confusion. The rest of the day was taken up with the practise of various situations on VHF radio.